ACTS 4:12 KJV "Neither is there salvation in any other: for there is none other name under heaven given among men, whereby..."
Neither is there saluation in any other: for there is none other name vnder heauen giuen among men whereby we must be saued. And in no other is the great salvation to be found; for, in fact, there is no second name under Heaven that has been given among men through which we are to be saved." 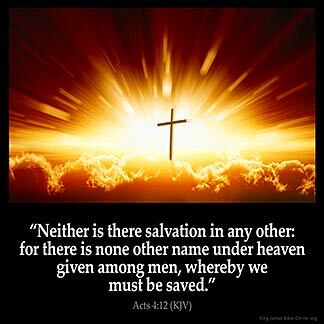 There is salvation in none other, for neither is there any other name under heaven, that is given among men, by which we must be saved!" and heelthe is not in ony othir. For nether other name vndur heuene is youun to men, in which it bihoueth vs to be maad saaf. 4:12 There is no other name whereby we must he saved - The apostle uses a beautiful gradation, from the temporal deliverance which had been wrought for the poor cripple, by the power of Christ, to that of a much nobler and more important kind, which is wrought by Christ for impotent and sinful souls. He therein follows the admirable custom of his great Lord and Master, who continually took occasion from earthly to speak of spiritual things. Ac 4:12 Neither is there salvation in any other. No other Savior but Jesus; no salvation if his is rejected; no other name or power to save from destruction, unless he is accepted. Why, then, should men invoke the Virgin, or the saints? No other name mentioned or written in the BIBLE--I think of all those including the Muslim population that adhere to the notion that Muhummed is their salvation. That is farthest from the truth and Satan delights in their following of the false religion to a certain Hell!!! JESUS is his Name !! That rests the matter, not budha, mohammed, confusius or krishna, the name is the LORD JESUS CHRIST period. and every knee including of the gods I mentioned shall bow before HIM and declare HIS Lordship.